What happens if my order still says “Pending” and it’s already charged? It means it’s being revised and in process. What happens if the trunk doesn’t fit me as I expected? How long do I have to change the product? 8 days after the purchase. Exchanges and returns are based on Terms & Conditions Policies. How can I start the claim process? Can I order vía telephone? Unfortunately no, it must be done via webpage. My product was delivered damaged. What should I do? 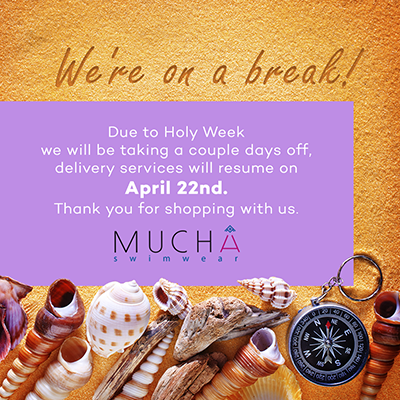 We’re so sorry, please contact info@muchaswimwear.com with every detail of the damaged product and we’ll help you. Please also visit the Terms And Conditions for more details about these cases. I didn’t like my discount product. We’re sorry, discount products can´t be returned. Supposing that my product came with some production damage, and I don’t want a new one. How long does it take to make the money reversion? We hope this never happens to you, but if it does, we make a thorough analysis to your case and talk to the bank. The issuing company will get you the information effectively. You must log in and enter your card information (credit or debit). We accept American Express, MasterCard or Visa. Of course. You can save some products for a future purchase. Just remember it’s subject to availability. I had a trunk on my wishlist and its not available anymore. Will you get more of it? We can’t assure you that we will have it back in stock. It also depends on which collection was your trunk, if it’s the latest one, we probably have more in stock. How much time will it take to send my package? If your purchase is to be delivered in Guatemala, it will be getting to you in 2-3 business days after. All On Request styles will take an extra 5-7 business days of fabrication, shipping, and handling process..
Do I have to pay extra for the shipping process? No, all shipping costs are included if the package is delivered in Guatemala. Can I change a trunk in any of your stores? No, we don’t accept that as a return policy. It states that the product must be returned in the same exact conditions when it was delivered to you, no more than 8 days from the delivery date. Please read our Terms And Conditions. My order has taken 3 business days already. What should I do? All On Request styles will take an extra 5-7 business days of fabrication, shipping, and handling process. We produce our swimwear in Guatemala City, Guatemala. Our raw materials are also made in Guatemala. We believe our brand should expose the greatest things about this country, so every piece of these trunks are 100% Guatemalan.